The Prodigious Milligram. Image taken from here. When I was in high school two of the many words used as insults shocked me. One of them was “self-sufficient.” Its stigma came from the mea culpa processes to join the Young Communists Union, where the candidates criticized themselves for not behaving — always — as part of a collective. Another pejorative terms was “conscious” or “aware,” which in that context referred to someone too intellectual, too devoted to books, too engaged in learning. The good students were labeled “super-conscious” and the natural leaders who emerged in each group also felt the taint of self-sufficiency. Better not to excel, not to overexert yourself… these disqualifiers seemed to warn us. Worshiping individual mediocrity generates mediocre societies. Vilifying the talented and entrepreneurial hinders the development of a nation. Professional capital is not constructed only with titles, degrees and post-graduate degrees, but with the need that arises from a population that reveres knowledge. It is also imperative that intelligence is not something to be hidden, almost with embarrassment or shame. We are all potential scientists and discoverers, in need of an environment where our capabilities find respect. A country of scientists should be able to show off its laboratories and vaccines; but also ensure that ordinary people can patent their achievements and be rewarded — materially and spiritually — for their ingenuity. There may be many university graduates in Cuba, but as long as these people do not find true social and legal recognition and salaries commensurate with their work, we can hardly call ourselves a nation of science. It’s sad that more statues are raised and more plazas dedicated to people who have wielded machetes or weapons, than to those who have saved lives with their microscopes and syringes. The prodigious milligram* of knowledge needs an environment where it can multiply. That fertile soil that carries the seed of education, the irrigation to imagine a better life through scientific discovery and the essential fertilizer of freedom. ** Thanks to Universal Thinking Forum for provoking this reflection … and much more. “Fascists” and Nazis/National Socialists have killed a lot of people around the world, including communists, anarchists, and socialists in Spain, and, these days, poor people in Greece. They apparently know the difference. I am sure that you can come up with something more accurate to call the ruling regime in Cuba. These kind of distinctions mean something. My family, and indeed many of the poor cigarmakers of the Tampa area, in addition to supporting the overthrow of Batista with their meager earnings, supported the Republicans in the Spanish Civil war. Some of my family were probably communists, and they certainly heard read to them Marx and other leftist writers while they rolled cigars all day. They were not evil and they were not lunatics, but people trying to create a better world. Because of people like Stalin and Mao, it has not always worked out so well, but many communists are being good partners in democracy these days. I want to know what we can do to get the PCC to evolve to support political democracy, if anything. If we can only wait for them to concede error for the last 54 years, please tell me your plan. Peace. Nick! THE CASTROFASCISTS HAVE BEEN IN POWER FOR OVER 54+ YEARS! BASTISTA AROUND 17 YEARS! This work documents loss of life and disappearances of a political or military nature attributed to the Cuban Revolution. Each documented case is available for review at The Cuba Archive and substantiated by bibliographic/historic data and reports from direct sources. Due to the ongoing nature of the work and the difficulty of obtaining and verifying data from Cuba, the following totals change as research progresses and are considered far from exhaustive. Cuba Archive is currently examining additional cases -most are expected to be added to this table. THE TRUE STORY OF CHE GUEVARA- The History Channel presentation: From his famous motorcycle trips to his historic role in the Cuban Revolution, Argentinean revolutionary Che Guevara is profiled in a documentary produced to explore the life of the man whose visage has become an iconic symbol of hard left politics. This man, who ordered the execution of countless human beings while in charge of the notorious La Cabaña prison in Havana, who terrorized Cuban society and who denied freedom to thousands of citizens whom he considered “deviants” or “anti-revolutionaries” can never be accepted as a hero, martyr or — the shock of it — a saint. INTRODUCTION: The saying “The fish die by the mouth”, refers to those who speak more than the necessary until being fooled by their own speech. Can his mythical reputation survive the publication of his own words? The objective of this article is to expose the truth about Che, to demystify it in the face of those who feel admiration by this mass murderer, exposing the facts based on his writings, diaries, speeches, letters and conversations with those who knew him. I forgot to mention one of the many other lies that keeps getting repeated. Che was not executed on the order of the USA. The US government asked the Bolivian government to keep Che alive, not the other way around. The Bolivians refused. So much for the USA ordering anybody around. Don’t say I blame the Bolivians. Che, responsible for stealing the land of Cuban peasants, went to “liberate” Bolivian peasants who had already benefited from land reform making them small landowners. He couldn’t recruit one Bolivian peasant to his cause, but he did steal their food. This would sound familiar to Cubans. To top it all, Che didn’t even know what language the Bolivian peasants spoke before landing in Bolivia. Talk about a genius military leader. In any case, good riddance. Do you realize that almost every statement in your last post is a lie? I would not expect less from you. Castro tortured and executed many people on the anti-Batista side as well. He got rid of all competition, like any mafia boss would do. You can’t even bear the thought of giving Cubans the vote, and justify the violence against mothers walking peacefully with flowers in their hands. In previous posts you have justified terrorism and mass murder. To claim you are against the death penalty is very fashionable these days, but coming from people like you, a complete lie. I would rather see millions of innocent civilians spared and a few psychopathic killers like Osama and Che executed. You would rather see the opposite and will always occupy the moral low ground. During the Batista/Mafia/USA run era leading up to The Revolutionary War many who opposed the regime were tortured and executed. During the Revolutionary War there were executions on both sides. When the war was over the winning side executed many who were on the Batista side leading up to and during the Revolutionary War. In Bolivia Ernesto Guevara was executed on the orders of the USA (and his hands cut off and mailed to USA for fingerprint verification). It is highly predictable that those who are vehemently against the Cuban Government historically and currently, would put forward the opinion that some of the above listed executions were somehow morally superior to others. My own opinion is that the death penalty itself is immoral and uncivilised in all circumstances. Europe is far from perfect in every way, but thankfully we have put the days of the death penalty behind us. Che was secured when he was killed. Bin Laden’s situation was precarious for our troops plus he was by that time the longtime leader of a worldwide death cult nihilistic terrorist organization. I am not one to debate the moral distinctions or defend things I do not completely understand but the point is revolution can mask a whole lot of arguably unnecessary killing, which is part of what I get from Humberto’s attachment. The unnecessary killing of the Czar and his family was the start of a bad trend on some of the communist left that should have never repeated itself. Che fought for liberation of the oppressed, but to the extent he did unnecessary killing against the defenseless, it looks like he suffered the same reciprocal fate. I don’t know if that is justice however. It would have been better to give him a fair trial and have a record of alleged crime and punishment. I am not acquainted with crimes in Bolivia he committed vis a vis “justice” as opposed to Bolivian law. He was waging another violent revolution, and was on the losing side and that is a dangerous place to be. The powerful are happy to let injustice fester. I hope there will more and more be political means to effectively address economic injustice, but when I see land grabs in Africa, I do not doubt that sometimes the powerless theretically may have to fight for their land, but it usually would not turn out well, and should never include terrorism. The ugly cycle of injustice and repression continues. I appreciate your message of political tolerance. I am glad Osama Bin Laden is gone too. As well as Che. Both were lunatics capable of killing millions. I am not against the death penalty, only against it being misused, which is often the case. In the case of Osama and Che, justice was served. It would have been a great injustice for either to walk free. I agree with your overall points. The taking of innocent life, whatever side one is on, must be avoided. Despite the suffering the “left” has brought upon Cubans, I would not wish for them to ever suffer the same persecution, or any persecution at all. All political views, as long as they don’t promote hatred and violence, should be listened to and respected. I am not defending cruelty by Che’ or anyone for or against revolutionary causes. I regret any non-combatant deaths and any deaths that were not during hostile fire in any revolution. The present times require focus against continuing cruelty and injustice. I am against the death penalty, but I am glad Osama Bin Laden is dead and would have pulled the trigger gladly, so I’m a hypocrite. The Battle of Algiers evidenced inexcusable acts that occur and which humankind must try to prevent from recurring. I will work for peace and justice the best I can. I am sorry for the pain that many of the people who write on this blog have endured. You have a right to the truth, but I hope that reconciliation will one day occur too. The CIA-supported Bolivian government at the time was not particularly concerned about the niceties of military or civilian justice, or with human rights and democracy in general: http://en.m.wikipedia.org/wiki/René_Barrientos. Does the Cold War never end? Was the killing of the captured Che in Bolivia consistent with the rules of war? The rules of Bolivian criminal law? Francisco! That list is of non-combat victims. Is all documented dear! Just click the link! Thank you for your post regarding the murderer Che on the anniversary of his death. Good riddance to him and soon good riddance to f & r when the biological solution finally happens. The world will be a much better place when they are gone. How many of those killings during 1957-1959 were against armed combatants of the Batista regime? I think my relatives in Tampa paid for some of those bullets. IN DISHONOR (or honor) OF Ernesto “Che” Guevara (June 14, 1928 – October 9, 1967) DEATH!! I WILL LEAVE YOU WITH A LITTLE LIST OF HIS DOCUMENTED MURDERS! JUST TRYING TO REFRESH EVERYONE’S MEMORY ON HOW THE CASTROFASCISTS ARE STILL TRYING TO CONTROL INFORMATION IN AND OUT OF THE ISLAND PRISON OF CUBA VIA ECONOMIC METHODS! FUTILE ATTEMPT, THE CAT (Twitter, Facebook, Instant messaging, internet etc) IS OUT OF THE BAG! But there are some surprises — like where Internet access is most expensive. While a number of factors play into the cost of getting online, geography seems to matter quite a bit, at least on the extreme ends of the spectrum. Island nations have more expensive Internet, perhaps because of the unusual cost of running the infrastructure into the country. These are the countries where a monthly fixed broadband subscription is most expensive, as measured by its normalized (i.e., at purchasing power parity) cost. The first number is the cost of Internet access, relative to the average purchasing power in that country. The second number is the absolute cost. CLICK LINK FOR ENTIRE ARTICLE! An even better example is the Mariel boat lift. Over a hundred thousand Cubans escaped before Castro asked Carter to stop accepting Cuban refugees. There was no embargo to blame for Cuban misery then, Cuba got billions in welfare from the Soviet Union. Everything Castro wanted he got. Cubans still went hungry and still wanted to escape. According to Cuban friends, there were hundreds of thousands if not millions of other Cubans trying to find their way to Mariel and escape before Carter cut off aid. The only thing stopping them were government agents armed with bars and bullets, the same mobs surrounding today’s dissidents. Nobody knows how many Mariel refugees they killed, but everybody in Cuba has stories of them surrounding and killing hopeful refugees. To call these millions of Cubans CIA agents or suggest they get funding from the US government is not only whacko, it shows a disgusting contempt for human life and dignity. 1) Very few dissidents have received any aid from the US government, and there is nothing wrong with the ones who do receive financial support. 2) Of the thousands who protested against hunger on the Malecon in 1994, how many received financial assistance from the USA? It was a spontaneous act of rage against the government. It was met with iron bars and bullets. 3) The mobs who surround dissidents are all paid government agents. There is nothing spontaneous about them. They are all armed or protected by undercover police who are armed. The dissidents are powerless to defend themselves against their violence without risking death. 4) More demonstrators in the USA have received financial assistance from the Cuban government than vice versa. The CIA does not organize mobs to surround them, invade their homes, destroy their homes, or beat them up. 5) The USA is probably the only country in the world that does not treat Cubans like sh&t. They are one of the few that tried to support the Cuban people against tyranny. I am critical of most US foreign policy, but its support of the Cuban struggle should be applauded. Most other countries are only concerned about how much profit they can make off Castro’s slave labor. Canada and the U.S. are not apples to apples with the island of Cuba on food. Put a U.S. embargo and loss of the major trading partners (Soviet Union/Eastern Bloc) on Hispaniola, which already has a lot of hunger, and you get a fair comparison to Cuba on food. I like Neutral Observers’ last sentence. Best wishes to all. I just lost to the cyber gods a lengthy comment I had written to Hank and Neutral Observer. Oh well. It was not meant to be. Peace. Hank and Neutral Observer, thank you for your responses. I greatly appreciate the Socratic experience at this blog. I especially like “If I love my neighbor, I will let him have his say and make sure he has enough to eat.” That is exactly my point. We need to do both. The neighbor concept is at the heart of what I believe, and I believe it should be at the heart of every society, and that every human is my neighbor. In my multi-disciplinary writing as a “garden variety” democratic socialist, I have discussed some of the many mistakes in collectivist agriculture, which of course predate Cuba (which is covered well by Prof. Bengelsdorf in The Problem of Democracy in Cuba), and predate Mao and Stalin and the Soviet Union. Many (but not all) utopian or religious communes of the 19th century, and even earlier in America with the initial European immigrants to the U.S., failed, sometimes resulting in starvation, often because of naïve assumptions about sharing, some of it based on New Testament doctrines and some of it based on other and various desires or views of the communal overlords. The fact that the communities often were undemocratic and had overlords was of course often part of the problem. In the area of agriculture, I am of the strong opinion that some collectivism is necessary (and indeed should have a global component) for coordination purposes, to ensure everyone eats well. But it has to be smart and is not necessarily communal, which often is not cooperative but rather capitalist, state or market, and exploitive of the wage-earning workers. I completely agree that much of the historical authoritarian manipulation of agriculture has been misguided, and as we see in North Korea today, can be part of a mass society of oppression–nothing liberating about that. But on the other hand, I do not need to believe that Cuba’s revolutionary agricultural history was not well-intended to see that it had a lot of what we can see now were unwise ideas. Moreover, Cuba is doing many things right in agriculture today and probably needs to continue to evolve. Its sustainability and strides toward self-sufficiency are vastly superior to other islands. It does not have the arable land of the U.S. and Canada, so those are not apples to apples comparisons. In the U.S., we have some smart collectivism, such as a great history of local cooperatives and over time, soil conservation; and some not so smart collectivism, such as programs to incentivize non-food bioenergy production using food (corn). I won’t try to write a book on the subject of smart agriculture collectivism in this comment, and it will hopefully suffice to say that material incentives are important to assure high productivity, but also government oversight is necessary to make sure the available arable land, one of society’s most precious assets, is deployed intelligently to ensure ample stocks of essential food items, coupled with one or more programs to assure that the food items are accessible to people. With workers’ gardens (http://gardenvarietydemocraticsocialist.com/workers-gardens/), the individuals and families can play a role in their own food justice and security, and societies can play one role in food justice and security by making sure everyone has this opportunity. There is in fact hunger in the U.S., and the demagoguery directed at the food stamp program is disgusting. (I discuss nutrient scarcity and soil at great length in the socialized technical paper beginning at page 100 of Pamphlet No. 1, English version: http://gardenvarietydemocraticsocialist.files.wordpress.com/2013/08/a-winding-path-to-workers-gardens1.pdf Spanish version: http://gardenvarietydemocraticsocialist.files.wordpress.com/2013/08/un-camino-de-bobina-a-jardines-de-trabajadores3.pdf). Quickly back to Hank’s discussion of my “love” ethic: Yes, stop signs are not directly about love, etc. in the strict sense. I am using the Jesuit doctrine of the relationship of love/justice/law. It is quite a good overall approach to my mind. Jesus, who I try to follow, reduced the law to loving God with all our hearts, minds, and strength and loving our neighbors as ourselves, which goes back to Neutral Observers’ sentence. I do not want to wear Jesus on my sleeve or force his doctrine on others, but I do believe it to be good for me to try to live by. I think that the philosophers who try to distill from our various religious and ethical beliefs some indisputable essence, such as natural rights, are interesting, but in the end, it is up to the society and the individual to work out an acceptable balance to assure our neighbors do not go hungry. This is best done democratically, but democratically is also a deep subject I cannot cover in this comment. Lastly, the absolute and ready categorization of people as lunatics, or not knowing right from wrong, etc., I generally reject as not constructive, with certain exceptions. I believe in my heart that many communists are very good people, but that does not mean that I think that only communists should get to vote and put up candidates and speak their minds. That is why I am for democracy and human rights for everyone–again on that we can agree even if we might have different or mixed rationales for why it is important. I choose in what time I have to look for truth AND reconciliation. Forgiveness is a ongoing process involved with both truth and reconciliation. My mother’s half siblings grew up in Opa-locka, under capitalism, which has a lot of alienation (http://gardenvarietydemocraticsocialist.com/comic/alienation-in-opalocka/) and needs a lot of what I will call mutual aid (http://gardenvarietydemocraticsocialist.com/2013/10/06/mutual-aid-in-opalocka/). I want to open my heart and mind to the people who live there. I do so as a species-being, a Marxist concept which I find completely compatible with my Christianity, including the doctrine of stewardship. I hope that I want to do the same for the people of Cuba, Saudi Arabia, China, North Korea, Somalia, etc. We live in a world of pain. We can isolate ourselves into conservative rhetoric that excuses our high tolerance to others’ pain, or we can try to help others the best way we can. Peace. ‘Human Rights’ means different things to different people. For example I would think that the provision of healthcare which is free at the point of need is a basic human right in the opinion of most. However it would seem that judging from the current situation in the USA, that not everybody would agree on this. Whilst by no means disagreeing with all that Hank says regarding human rights, I do find the following to be alarming “….supporters of the Cuban government (which I take to be a mob of lunatic fanatics)”. To suggest that all supporters of the Cuban Government are lunatic fanatics is somewhat less than objective. Bear in mind that many who protest in favour of co called ‘human rights’ in Cuba are being paid by the US Government. This is a well known proven fact in Cuba. The USA regards Cuba as an enemy and has an economic blockade in place despite the opposition from the representatives of over 95% of the human race. In the USA itself one would struggle to find any kind of overall majority in favour of this blockade. When a minority are being paid to protest by an extremely powerful country that treats Cuba as an enemy, then there are plenty of people in Cuba ready to counter them and shout various forms of ‘abuse’. Shouting ‘DOWN WITH HUMAN RIGHTS!’ is of course disturbing. It its far less disturbing when put in the blatantly obvious context of the fact that the ‘human rights protesters’ are being paid by a foreign power which treats Cuba like s**t.
I won’t get into the philosophical debate about human rights here, but I do know that societies like Cuba and China where government thugs screamed “We sh&^ on human rights” are also societies where the government sh&ts on the hungry. It is not a one or the other situation. It is usually both or nothing. In Canada there is absolutely no poverty, and as other posters from the USA have noted, certainly no hunger within memory of the last few generations. In Cuba most people have gone hungry. As did most people in China and the Soviet Union at one time. In fact, millions of them starved to death. Those who took away their right to free speech also took away their food. People do not become dictators to feed the hungry. Despite propaganda to the country, which only the most naive could possibly believe. If I love my neighbor, I will let him have his say and make sure he has enough to eat. I am sorry you did not find Azel’s human rights analysis to be very impressive. I thought it was good. With all due respect, I think you may be missing the point of Azel’s essay. The point of the essay, in my view, is to examine the basis of human rights – not what they are, but where they come from and how we can say that they exist. I think human rights do exist. Contributor Marabu is willing to sell those rights for ten dollars. That’s a curious statement contributor Marabu makes because it at once acknowledges the existence of human rights, which he is willing to sell for ten dollars, but at the same time indicates that he thinks they have little or no value. Human rights are worth ten dollars to Marabu. His point of view can safely be regarded as an outlier. It is a data point that does not correspond to reality and we should discard it for tens, if not millions of reasons that do not bear repeating here. Azel’s use of the examples of vacation homes and multiple consorts was merely to prove a point by taking one of the positions that explain where human rights come from to its logical extreme. I don’t disagree with him and I don’t think his examples are inane. They are just examples. You say that “most people know right from wrong.” Maybe. I don’t know. I think a lot of people don’t. Getting back to Azel’s article, I do not think that human rights are moral laws that come from God; or that human rights are political laws created by governments. I do think that human rights come from man’s nature, as Azel says – whatever that may mean. The Federalist Papers, I think, address these topics and it is one of my goals to someday find the time to read the Federalist Papers. One final point. I don’t know what you mean when you say love should define justice or that laws that are unloving are unjust. The concepts of love and law are completely different. To conflate the two makes no sense. Love is an emotion. Laws, on the other hand, are made by man as part of a social compact to help us all get along according to a set of rules that bridge our differences. For example, we all agree to stop at red lights at intersections. That has nothing to do with love. It has everything to do with keeping streets safe. Another example is voting rights. Here in the U.S., adults who are not felons can vote if they register prior to an election. That’s the law. It is not love. Another example: if someone files a lawsuit against you in a court of law and you do not answer it, you lose by default if you knew of the complaint. That’s the law and a good one too. Where’s the love there? Marx’s criticisms of capitalism were accurate for the most part. He did not, however, provide a blue print for how to replace it with something better. Democratic socialists believe we should try, but we cannot presume to have all the answers or to be above reproach. If we have to have the authoritarians in one corner and the market capitalists in the other, and a fight between the two as the defining quest of humanity, we are screwed. We, us humans, you and I, with all our differences, have to learn to work together. So much of the Cuba conversation seems to be about hatred and history, and not enough about beans and rice. Yoani’s instruction to be courteous is fairly profound. Peace. I didn’t find that philosophical analysis to be very impressive. Eating is important to each human. To the extent collectivism is necessary to accomplish that objective, it is moral and necessary. The vacation home and multiple consort illustration was inane. Most people know right from wrong. It is wrong to let people suffer from material want or from cruelty imposed by any government or individual. I don’t need a columnist to tell me that. Or Locke. Or Marx. Etc. Love should define justice. Laws that are unloving are unjust. Works for me. Milton Friedman may not like it. Marabu’s post this evening on the topic of human rights may be the most revealing and frightening I have ever read on this site. It is stark. It is stunning. It is scary as hell. I have no idea why anyone would support such a point of view. Coincidentally, or maybe not, Jose Azel published a terrific article in the Miami Herald a few days ago on this same topic. Why on Earth would anyone do this? How can individuals and governments hold such a condemning view on human rights? As Americans we demand our rights; we admire the struggles of peoples everywhere claiming their rights; we worship the unalienable rights of life, liberty, and the pursuit of happiness proclaimed in our Declaration of Independence. Collectivists, however, see rights differently, so where do rights come from? Are rights man- made, the social creation of a particular vision of society as Marxists claim? Or, are rights a self evident endowment of our Creator as Jefferson asserted? The question of whether rights are creations of particular societies, or independent of them, is fundamental to our stance on standards of moral conduct and political organization. There are three principal epistemological traditions on the origin of human rights: (1) Rights are moral laws and they come from God. (2) Rights are political laws and they are created by governments. (3) Rights are moral laws inherent in man’s nature. If human rights are simply a creation of the human intellect it is very difficult to argue that they are universal and that every government is obligated to honor rights they disagree with. Accordingly, Karl Marx denounced rights as a fabrication of bourgeois society. Moreover, if rights are no more than a whimsical invention of government, they can be revoked at the pleasure of the government; they are permissions, not rights. On the other hand, if rights emanate from God and exist prior to, and distinctly from, any man-made law, they cannot be granted or repealed by government fiat. Unfortunately, no divine origin for human rights can be judiciously advanced since there is no evidence of such divinity, much less evidence of the existence of rights that demonstrably emanate from God. An additional problem is that there is not one God that is universally recognized and thus we are left to decide if it is the moral code of Yahweh, Allah, or Brahman that should prevail. To anchor rights on a divinity is to admit that there is no evidence to support the existence of universal human rights. These classical expositions of natural law retain the philosophical problem that if natural rights come from God, then proof of their existence depends on proof of God’s existence. To address this, modern thinkers have developed a number of more secular natural rights theories that do not originate with a Divinity. But it is this genre of issues that have led some philosophers to mock belief in human rights as “one with belief in witches and unicorns” (Alasdair MacIntyre) or “nonsense upon stilts” (Jeremy Bentham). The United Nations Declaration of Human Rights declares that human rights flow from “the inherent dignity of the human person.” This too can be a problematic concept as no universal agreement can be reached as to what is needed for a life of dignity. Some will claim that a vacation home on the beach is an absolute necessity for a life worthy of a human being, others require multiple consorts. Who is to say? Totalitarian regimes take advantage of this philosophical quandary to subordinate the individual to the state. Since governments hold a legal monopoly on the use of physical force, we need individual rights to protect ourselves from the involuntary servitude to others demanded by collectivism. Our best intellectual argument is that each individual is morally an end in himself/herself and not a means to the ends of others. This means that individual rights are our defense against collectivism. Individual rights may, or may not be, God given, or inherent, according to our personal beliefs. Human rights may just be an aspiration or an artifact, but in a social context, they are what we require to live in freedom. Francisco, You’re reading something into my post that I did not say. I merely said that Marabu, a dictator admirer, has praised Mao and Fidel in this comment section. I didn’t make any comparison between the two dictators. Trevor, I am no expert but in my continuing campaign to tick off everyone, I have to say that Fidel/Raul Castro are and were nowhere near Mao (or Stalin) in terms of repression, just as Cuba was and is nowhere near the North Korea of today in these terms. I have sometimes not been careful enough myself in making these distinctions. I am willing to follow Professor Carollee Bengelsdorf’s more careful analysis and give Fidel Castro the term “paternalistic authoritarian,” which implies the possibility of good-intentioned ends intended to justify authoritarian means. But in the long run, whatever you call it, and whatever the motivations, I believe that it is counter-productive for numerous reasons, and plain wrong to the individuals who are being repressed. One person wrongly imprisoned or executed is too many. My aspirational goal is to look forward to a day when political democracy and human rights will be present in Cuba, and for that matter around the world, within the context of democratic socialist constitutional frameworks to ensure no one goes without. In many places around the world, where people are hungry, they do not have the luxury of waiting on ballots to bring them bread or stop the land grabs. In the most fundamental sense, bread=justice and arable land=justice. (There also are such as thing as emergency conditions, such as right after the Bay of Pigs or right after the attempted coup against Chavez, but not for decades on end, as in the Cuba of today.) I think that many sincere communist authoritarian supporters have good motives and are keenly aware of that importance, i.e., the primacy of the material, but ultimately the brilliant sincere communist Rosa Luxemburg believed that political democracy and human rights would be good and even necessary under socialism. I agree with her. The denial of political democracy and human rights are the great tragedy of historical socialist experiments of the last 90+ years. I tried to discuss the “squandering” issues in this post the other day: http://gardenvarietydemocraticsocialist.com/2013/10/04/the-truth-squandering-boycott-and-lack-of-political-democracy-and-civil-rights-in-cuba/. I also discussed the value of a communist/democratic socialist dialogue in Cuba here: http://gardenvarietydemocraticsocialist.com/2013/10/03/cubans-for-a-participatory-and-democratic-socialism-spd/. Marabu, I agree that feeding people is the one indispensable priority. And it is because I value it so much that I don’t want socialist credibility squandered on spying. Yes the NSA under a Democratic administration is doing too much information collection, which I hope is aimed at stopping the real threat of terrorism. The U.S. I will gladly enter a plea of guilty for in many regards. They may monitoring my email, internet usage, and my phone calls, but they are not coming on this blog and telling me they are in order to squelch my comments. So I will continue when I can. And there you have it……human rights, and free speech, mean little to Marabu. That explains a lot. Like why he has stars in his eyes for dictators like Mao and Fidel. How could human rights mean anything to someone who admires such despots? I wish you well in your beliefs of human rights and free speech. These things, while nice to have, mean little to me, so that we probably wouldn’t agree on many topics. Why? You say you are against the Tea Party, but whose government is spying on you via the NSA: the Tea Party or the Democrats? If you are really hungry one day you can sell me your free speach. I’ll pay you $10 for it. Not that I need it, but it feels good to feed a hungry person once in a while. Marabu, I want to promote understanding and reconciliation. I appreciate some of what you are saying, and I mean no disrespect, but I have a concern. I am a complete outsider, and I think unbiased. I live in the deep south of the U.S. I am not a Cuba expert, and just a human being who tries his best. So please forgive me if I am misunderstanding something. I am greatly appreciative of the bravery of people who speak their minds the best they can in Cuba and in the U.S. The U.S. does not have nearly enough free expression from the socialist point of view. This is a horrible remnant of the McCarthy era and ongoing intimidation by the Tea Party types, etc., which I am doing my best to digitally counter a little bit in my spare time. Societies benefit through free expression and the voicing of disagreements. People in Cuba still face repression and spying. It is an authoritarian state. I know this to be true not only from a lifetime of reading in the biased U.S. press but also from direct accounts from friends on whom I would trust with anything as well as from reliable independent and scholarly reading. Among many other things, Cuba does not allow its citizens to have open and full internet communications, so that things I have to say, they may not be able to learn of, assuming they were interested. When I read “Maybe the motocycle parked in front of your bulilding is a prize received by a Hero of Labour?,” it gives me pause. Exactly who told you that? What business is it of you or the government who has a motorcycle in front of whose building? I am a DEMOCRATIC socialist. George Orwell is one of my heroes. I believe in human rights, including the right of free speech, for all people, including the people I disagree with on fundamental issues of politics and economics. In my own country, I have to use a pseudonym for my socialist work, so I am by no means biased in its favor in this regard. Please help me to understand why you need to know and point out your knowledge of someone’s building parking arrangements. I agree that there is no proof the US has used bio-weapons against Cuba. Application of a bio weapon is very easy to hide, unlike conventional bombs or napalm. You just drop a handkerchief in the right place. So it is pointless to discuss whether some lunatic US president has ordered it or not. What I can unterstand, is that the rumours pointing the fingers on the Pentagon fall on very fertile ground in Cuba. The United States is the last imperialist power to support an armed agression against Cuba. While the spanish sins are long forgotten, those of the Bay of Pigs are not. Or maybe I’m the lunatic for responding rationally to a lunatic? As I said, the lunatics here have worn me out very quickly. Looking over previous posters comments, the ones who actually knew something about Cuba, I’m amazed that some of them lasted so long trying to educate Nick and Co on the reality in Cuba. I’ll try to keep my posts shorter or remove myself from the asylum. 1) There is no evidence of a swine flu epidemic in Cuba around 1970. Swine flu is a recurring problem in swine, infecting swine both in Cuba and neighboring countries. Swine flu is not more likely to infect Cuban swine just because they vote for Castro. The only evidence is that Castro said he killed 500,000 pigs and said the CIA made him do it. Castro is known as Cuba’s biggest lunatic. He once decided to destroy all the fruit trees around Havana and replace them with coffee trees that were impossible to grow in Havana’s climate. I believe he also blamed the CIA for that failure and for the failure of his 10 million ton harvest. 2) There is no evidence that the USA introduced swine flu into Cuba. All journals and media outlets repeat lunatic conspiracy theories. The Canadian CBC even ran a lunatic documentary that the Apollo landings were all a hoax, which is a favorite conspiracy theory among the Castro lunatic set. Some Cuban teachers still teach it. Doesn’t mean it’s true. There are no traceable sources that the USA introduced swine flu into Cuba, either outside or inside Cuba, except for Castro. At least the Apollo hoax documentaries manage to find a few lunatics to interview. Think about it Nick. If you believe in the swine flu conspiracy, you’re an even bigger lunatic than they are. But we already know that. I don’t expect that you’ll admit you are wrong about this or anything else. You won’t let go of this, will keep insisting you are right, will keep repeating everything you ever read in Granma. Only lunatics insist they are never wrong. It’s a big ego thing, the need to be the center of attention. You’re lack of self-awareness, inability to admit you are ever wrong, and enormous ego are a bit non-socialistic, don’t you think? Maybe it’s because guys like you are the guys who always support guys like Castro that socialism is always a big failure? The San Francisco Chronicle is a very well respected news outlet. It has been in existence for a century and a half, survived the earthquake of 1906 and has won various Pulitzer Prizes for its reporting. I do not recall Fidel Castro ever having any editorial control over The San Francisco Chronicle, nor do I recall its workforce being infiltrated by Cuban Agents. The San Francisco Chronicle is known as ‘The Chron’ and ‘The Voice of The West’. I appreciate your response am glad that you are against all forms of biological warfare. In this regard it would seem that we are actually in rare agreement. Treaties have been signed and the use of such methods is now deemed to be ‘appalling’ or ‘indefensible’…. However this was not always the case. For example way back in the 18th century The British Military used the smallpox virus against Native Americans. During the Cold War biological weapons were developed as part of the arms race. This form of weaponry was rapidly developed on both sides. In Cuba there are a lot of rumours that fly around. Some information does indeed seem a bit wild and whacky. When people tell me stuff I always try to reach a balanced conclusion when weighing up whether to believe them or not. Prior to reaching my conclusion I look at all sides of the story. Like any sensible person I am wary of my conclusion being unduly influenced by any of my pre conceived ideas. I find the assumption that the USA was not involved in the spread of the swine flu virus in Cuba around about 1970, to be a very odd assumption. I would be interested to find out why people like to make this assumption. I very much agree with you that the excesses of the financial sector should not be countenanced in a democratically controlled economy. This post simply says that white is black and black is white. Merits and achievments of work are being recognized in Cuba more then in most other countries of this planet. You don’t need to live in Cuba to know that that the medals of “Hero of Labour” are being awarded to the most outstanding Cubans. The media are widely reporting about them, the top goverment officials meet and congratulate this people and even the President mentions them in his speaches. Material rewards come along. I was told that the best suggar cane cutters get refrigerators and computers, not just diplomas. Can anyone remember a US President rewarding or even mentioning someone for outstanding work for the country? I mean work, not fight, becuase the US does reward excellent soldiers while labour is just another merchandise on a capitalist market. Dear Yoani, just for a while would stop reading Fox news and the Miami press and have a look at your own country. It will imporove the quality of your blog. Maybe the motocycle parked in front of your bulilding is a prize received by a Hero of Labour? I learn much from your points of view, both directly and in challenging me to think more broadly and deeply. Solidarity should be not rendered inconsistent with giving one’s best efforts as an individual. 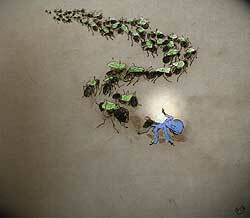 The ant colony cannot survive without each ant being individually challenged to do their best. Good point. Of course, I cannot speak for ants, but not every human is strong or amazing, and no one should be left out of the social compact because they are not strong or amazing. Both material incentives to excel as individuals and moral incentives to excel as giving human beings are necessary to motivate individuals in their fullness. The Lords of Wall Street may be “productive” for their individual selves with rip-off schemes like derivatives and mergers and acquisitions that provide no little or social value, and this should not be countenanced in a democratically-controlled economy. So-called creative destruction can wreak a lot of human havoc and produce a lot of material waste that is of questionable net gain for the people overall. It should be up to a society to democratically develop a social compact that ensures high levels of effort and competence but also leaves no one out. Stewardship implies that we should try to be both our most excellent selves and our most compassionate selves. If we only concern ourselves, and shape our societies, to ensure that the “cream rises to the top,” and if only the bread “winners” survive, we can leave people behind in harsh slums, as often happens under market capitalism. Alienation and unemployment is the result, which often leads to crime and drug abuse, and other sad money-seeking outcomes including prostitution. We should not provide incentives of desperation where individuals are forced to rise to the top by stepping on others. Grim Opa-locka’s alienation and crime is not something to replicate, just because there is also a bright and shining Miami Beach. Without deep democracy, which exists in neither Cuba or the U.S., the honest maturation of both individual and group dynamics is cut-off in one bad way or another.